The WCL-X100 Wide-Angle Conversion Lens for X100 Camera (Silver) from FUJIFILM converts the lens on your FUJIFILM X100 camera from a 35mm equivalent lens to a 28mm equivalent lens, giving you a true wide-angle lens. Even better news than that: Fuji engineers have treated the conversion lens and the original lens as a single unit, so that there is little, if any, loss in image quality. They've designed newly developed firmware designed to correct for distortion, peripheral brightness, lateral chromatic aberration, etc. The original lens apertures are still operative, so you can still shoot at f/2 (although, as with the original lens, the sharpest images will come in the f/4 to f/5.6 range). Either the optical or the electronic viewfinder can be used, and even close-focusing produces sharp, clear images with no loss of acuity. You can still use RAW files and shoot with Motion Panorama 360. Even the lovely bokeh of the X100 is undisturbed. Using the built-in flash can cause vignetting, so the use of an external flash is recommended. The included lens cap fits the 49mm diameter of the conversion lens, as does the optional PRF-49S protective filter. For optimal aberration control, X100 firmware must be updated to version 1.3.0 or later. Box Dimensions (LxWxH) 4.3 x 4.0 x 3.9"
WCL-X100 Wide-Angle Conversion Lens for X100 Camera (Silver) is rated 4.8 out of 5 by 26. Rated 5 out of 5 by Terry from Great piece of glass! I shoot professionally. Done so for many, many decades. Cut my teeth on a Leica M. Until I purchased an X100S I never found another camera that felt right in my hand. This does. But the fixed 23mm lens (35mm in full frame) just wasn't enough. I'm a wide guy. The 28mm on my Leica was my normal. I really didn't expect much from a converter lens but I had to try. Surprised doesn't come close to what I saw when I looked at my files. Shock, awe, delight is more accurate. This lens is every bit as sharp as any Elmarit I ever used on my Leica, only MUCH less expensive. If you have an x100 or x100s buy this. Right now. It may never leave your camera. Rated 5 out of 5 by Tekkie from Delayed in getting one........ I am still an X100 user but delayed in getting one of these because I wanted to see if Fuji was going to retain compatibility with the new X100T (I decided to skip the X100s upgrade). On my X100, the performance is really tremendous and even pixel peeping, one can see no sign of color fringes. Fuji did a great job on this from the beginning and it's absolutely worth the money. The build is also exquisite and I look forward to even better shots with a new X100T. Rated 4 out of 5 by Gil from Useful lens I mostly agree with the other comments. Having a 28mm field of view is very nice. The lens is high quality, I did buy a metal screw on cap for the mount side, since it comes with a rubber cover that falls off and is not very well designed. Also, I use Manual focus mode and then auto focus pushing the button on the back, and this lens does seem to interfere with the auto focus often, it will focus at 3m or 5m when you are clearly trying to get it to focus on infinity in a scenic shot. But when its working right the images are the same excellent quality as the built in 35mm (in 135) lens. It is a good value I think, now if they would just make a telephoto adaptor to give anything from 50 up to 80mm I would buy that too and be done! Rated 5 out of 5 by Palouse River from Don't wait, buy it Too bad Fuji doesn't just offer the X100T in a kit with the WCL-X100 and TCL-X100 converters. My WCL-X100 just lives on the X100T in a Black Raqpid SnapR-35 that goes just about everywhere with me. Just remember to set the conversion lens setting correctly in the X100T or you will need to correct some minor distortion in post. Rated 5 out of 5 by photolinks from adding to the passion... Sharp lens, great add on for the fuj ix100s, adding versatility without bulk. I love the fact that I can change lens with out exposing my sensor. Image quality is excellent. Can't wait to order the TLC! I shoot the images I need with the Canon 5DMlll- but the images I am most connected to are coming from the Fuji x100s. Rated 5 out of 5 by sconcin from Works perfectly ! I was somewhat concerned about this product, as it looked like an afterthought, but all worries disappeared once I installed it. It is built like a fine piece of optics, the mounting is secure and it is most definitely NOT an afterthought ! Image quality is excellent edge to edge. Firmware upgrade 1.3 takes care of the slight distortion. Rated 5 out of 5 by ken from Great add-on! I wouldn't normally buy add on lens modifiers but read a good review of this one so decided to try it. The resulting files are so close in IQ to those produced by my X100 bare necked that I can't see any degradation at all. I'm sort of a halfhearted pixel peeper - I know enough to make decisions but don't get so deeply into it as others do. My liking this accessory should be taken with this in mind. This is quick to install and easy to carry. If the firmware is up to date the camera will know it's there. Can't wait to try it on the new X100s that's in the mail! can I use this lens with my x100f? Can I use this lens with my x100T? Yes you can! It can be difficult to get that protective ring off the lens of the camera at first to reveal the threading the wide angle screws onto. I used a clean dish glove to unscrew it for grip. 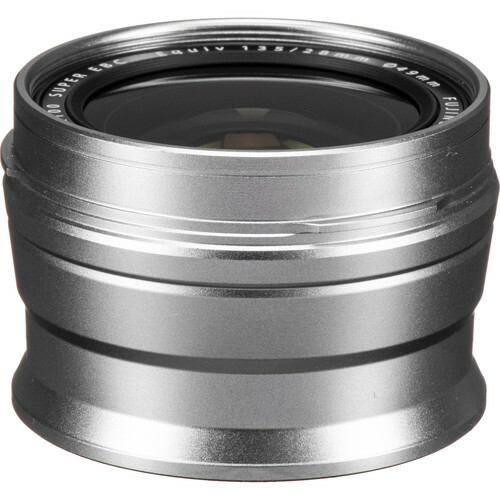 Does this wide angle conversion lens need an adapter to attach to the Fujifilm x100 camera? No. You remove the ring on the front of the lens and just screw it on. It says firmware 1.3 is needed, but the x100T does not have FW1.3 ... is this a mistype? how does one attach a filter to this lens? A 49mm filter will fit on the lens. Does someone tested it with another camera than the Fuji X100T? Results? I use it with the X100. I think there is no deterioration in image quality.